Designation: School of Chemistry, Bangor University. List of Author(s): Hongyun Tai, Osita Wilfred, Ray Marriott, Qiuyun Liu, Viacheslav Tverezovskiy, Simon Curling. copyright: © 2018 Tai H, et al. This is an open-access article distributed under the terms of the Creative Commons Attribution License, which permits unrestricted use, distribution, and reproduction in any medium, provided the original author and source are credited. The use of biodegradable polymers and their composites have wide applications and high demands because they can be ideal alternatives to non-biodegradable polymers due to the growing global environmental concerns. The biodegradation of PLA and starch-based plastic composites by the use of enzymes was studied in a commercial compost and soil. The composites were prepared from two biopolymers, i.e. polylactic acid (PLA) and starch, using Brabender 30 EHT mixer at the composition of 10:90, 25:75, 50:50, 75:25 and 90:10 (weight ratio) respectively, and then their degradability was investigated under controlled compost and soil burial laboratory conditions for 14 and 28 days. The grades of different composite ratios of PLA films formed were more flexible than pure PLA film. The degradation was measured throughout the period of the experiment by visual inspection, gel permeation chromatography (GPC), thermal gravimetric analysis (TGA), scanning electron microscopy (SEM), Fourier transform infrared (FTIR), titration and gas chromatography (GC) analysis were performed on these biopolymer composites before and after degradation experiments. GPC analysis confirmed that the molecular weight of PLA decreased due to degradation, while TGA analysis showed a lower thermal stability for the composites containing more starch. The visual inspection and SEM analysis revealed that the size of polymer composites reduced while the shape became less regular owing to the biodegradation. FTIR spectra of polymer composites showed strong carbonyl bands between 1750.9 cm-1-1760.2 cm-1 that became broader with a slight shift to higher wave number to 1756.1 cm-1-1763.7 cm-1 after degradation. Moreover, the addition of lipase into the compost and soil promoted the degradation rate of polymer composites, leading to the generation of more co2 gas and more weight loss, compared to the experimental results obtained without the use of lipase. To conclude, the degradation rate of PLA/ starch composites can be tailored by changing the composition and environmental conditions (such as temperature and the addition of enzymes). Polylactic acid, potato starch, blends, degradation, commercial compost, natural soil. Non-biodegradable petroleum-based commodity polymers, such as polyethylene (PE), high-density polyethylene (HDPE), lowdensity polyethylene (LDPE), polypropylene (PP), polystyrene (PS) and poly terephthalate (PET), have caused serious environmental concerns globally . Although huge efforts have been made to recycle commodity plastics and reduce the landfill, it is still not costeffective. Therefore, alternatives are sought for, which can be produced from renewable resources and can degrade in a natural environment without generating harmful and toxic residues . Decades of studies have led to the discovery of many biodegradable polymers with distinctive properties, such as polysaccharides, proteins and polyesters [2,3]. Polylactic acid (PLA) is one of the commonly used polyesters . PLA can be synthesised by condensation polymerisation of lactic acid by the action of microorganisms or synthesised by catalytic ring opening polymerization of lactide (ROP) . The condensation polymerisation normally produces PLA with low molecular weight, in contrast, the ring opening method can produce PLA with high molecular weight using catalysts, such as oxides of Zn, Sn, chlorides of Zn and tin (II) octanoate. The properties of PLA are dependent on the molecular mass, the degree of crystallinity and the ratio of co-monomers [6,7]. PDLA is the product resulting from polymerization of D-lactide, while PDLLA is the product resulting from polymerization of a racemic mixture L- and D-lactides [8-11]. PLLA and PDLLA have different crystallinity, i.e. PLLA is a semicrystalline polymer while PDLLA is completely amorphous . They polymers exhibit good applications, both in the amorphous and semi-crystalline state [13,14]. Because of its biodegradability and biocompatibility, there has been an increase in the applications of PLA in both biomedical and industrial sectors. They are seen replacing commodity packaging materials . PLA can be hydrolysed to form non-toxic, harmless substances, such as co2, water, methane, biomass humic matter and other natural substances [16-19]. The degradation of PLA and its composites occur in stages; the dispersion of water into the material, then hydrolysis of ester bonds and therefore dropping in the molecular weight. The rates of hydrolysis in PLA and its composites increases with water content and increase in temperature [4,11] and are enhanced by the unrestricted carboxyl groups of the hydrolysed PLA ends. Degradation of PLA is faster at a temperature above its glass transition temperature coupled with high moisture content and high microbial attack [20,21]. These factors put together to affect the scission of the polymer chain bonds through hydrolysis leading to decrease in the molecular mass of the polymers . Starch is also an attractive biodegradable biopolymer because it is cheap with low density and can be blended with other polymers to produce composites with tailored properties. Starch [(C6H10O6)n] is a carbohydrate polymer made up of many monosaccharide units joined by glycosidic bonds, thus it is a polysaccharide. Starch consists of linear amylose (20-25%) and branched amylopectin (75-80%) at ratios that vary with the sources . Starch has wide applications, for example, it is commonly used as thickeners and stabilizers in puddings, custards, and glucose syrup. It is used as an encapsulation agent for pesticide formulations, in cosmetics and toiletries products and as an adhesive in the paper industry . Starch undergoes complete degradation in a natural environment by enzymatic hydrolysis into glucose which is then metabolized into water and carbon dioxide, therefore, the degradation of starch and its composites start from the outside into the inside of the material. Starch mixed with other polymers alters the rate of degradation of such material . Polymer blending is an approach commonly used to obtain advanced properties that individual polymer component does not have . The blends of PLA and starch can offer numerous benefits because starch is renewable, inexpensive, and available all year round and their blends are biodegradable in composting conditions to form nontoxic materials. High temperature and humidity are significant to start hydrolysis followed by biodegradation process . There are different methods for blending two or more polymers together, e.g. thermal blending, solution blending and physical mixing [27-29]. Blending PLA with starch can increase the biodegradability and reduce the cost . When no additives were used in the blending of PLA and starch, the results showed high brittleness and low impact resistance because of the poor miscibility between hydrophilic starch and hydrophobic PLA. Good interfacial adhesion of PLA and starch blends can be achieved by grafting PLA and starch using maleic anhydride (MA) . The blend of PLA and starch can be used as drug delivery systems and food packaging materials to replace conventional plastic wraps [32,33]. It is against this background that this work was carried out to check the degradability of PLA/starch under environmental. The aim of this work was to study the biodegradability of PLA/starch blends in a commercial compost and a natural soil under lab conditions. Several fungi and bacteria have been seen to degrade PLA and its composites . The addition of enzyme into the setup was employed to hasten the degradation rate of these polymers, Rhizopus oryzae is an enzyme used in the study because it is known for its role in the degradation of polyesters [34-36]. Although checking the weight loss of polymers and composites reveal analytical significance, but a number of combine techniques (e.g., morphological change, mechanical and spectral methods) can also be used to offer practical description for the complete process of polymer degradation . Polylactic acid (Ingeo Biopolymer 2003D, extrusion grade from Nature Works LLC in Blair, Nebraska, USA) and potato starch (from FinnamlyOy Finland) was kindly provided by Greener Polymers Ltd. Lipase from Rhizopus oryzae powder (10 μ/mg 62305 -1G-F Sigma-Aldrich, UK), concentrated hydrochloric acid (high purity grade, >99.5 %, Sigma- Aldrich, UK), phenolphthalein (Sigma-Aldrich, UK), sodium hydroxide (Fisher, UK) and potassium bromide (Fisher, UK) were used as received. Multi-purpose compost which is made up of organic materials such as manure bedding, grass/leaves trimmings, wood wastes and municipal waste from food source was purchased from B&Q Bangor (North Wales, UK) while the natural soil samples were collected from the surface to the depth of 0-15cm of “Bluebell and Bracken Climax Vegetation” (in the Snowdonia National Park established in 1951 is located in Llanberis, United Kingdom with latitude of 52° 54’ 59.N” and Longitude: 3° 53’ 16”W, covers an 823 square miles (2,130 km2) in area) in Nov 2015. PLA and starch were dried in a vacuum oven at 50°C for 12 hours prior blending according to the procedures described in section 4.2. Formulations were compounded on a Brabender 30EHT mixer were thermal blends of potato starch and PLA at different weight ratios were formed. The mixer was operated using the WinMix software suite. The mixer was heated to the temperature of 180°C before PLA and starch were fed into the feeding chute using a manual loader and allowed to mix for 10 minutes using the ratios of 10:90, 25:75, 50:50, 75:25 and 90:10 respectively. After mixing was completed, the front plate of the mixer was removed allowing access to the blending chamber. The resulting polymer blends were removed from the rotating blenders then shaped into square shapes with dimension about 3 cm x 1 cm and thickness about 2 mm manually and allowed to cool. It was observed that the blends containing more starch were brittle, thus easy to break-up during handling because no plasticizer or compatibilizer was used. The experimental set-up used for the degradation studies of polymer samples buried in compost and soil using NaOH trapping solution to catch the co2 released. 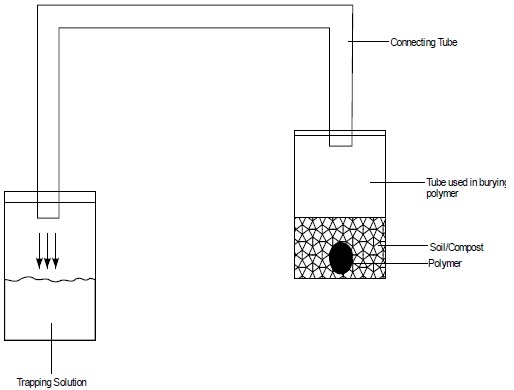 Figure 1: The experimental set-up used for the degradation studies of polymer samples buried in compost and soil using NaOH trapping solution to catch the co2 released. W0 is the original polymer sample weight; Wm is the weight of polymer samples after they are removed compost or soil at different time points. During biodegradation, the polymers and their composites were subjected to biodegradation check using this method, ASTM D-5488-94d: Standard Test Method for determining carbon dioxide, methane, water, inorganic compounds, and biomass from the biodegradation of materials. The main mechanism is the enzymatic action of microorganisms, coupled with other factors,  which can be checked by standard tests over an exact period of time. It could be under aerobic or anaerobic condition . The release of co2 was monitored and determined according to the section 4.4. In addition, the polymer blends before and after degradation were characterized using a range of techniques described in section 4.5. A number of visual, physical, and morphological properties of the composites were assessed after they were removed from the compost and soil. The full description of the experimental setup is can be seen in the results and discussion section. Figure 1 illustrates the experimental set-up used for the degradation studies of polymer samples. Microbial respiration was ascertained by measuring the released C-co2 trapped in the alkaline solution, by titrating of the remaining NaOH with hydrochloride acid after adding 2.5 mL of BaCl2.2H2O and phenolphthalein indicator. The C-co2 generated was expressed in mg C-co2.kg-1 dry soil and the Eq.2 was used for the calculation . Where VB= the volume in the millilitre of hydrochloric acid used to titrate the blank sodium hydroxide solution to the endpoint. V=the volume in the millilitre of a hydrochloric acid used to titrate sodium hydroxide solution connected to sample tubes in which polymers were buried in either compost or soil for degradation studies. E= 22 (Half of the atomic weight of carbon dioxide). A Gas Chromatograph PerkinElmer Agilent model (Clarus 480) equipped with thermal conductivity detector (TCD), operated using Totalchrom software and was also used to quantify the co2 generated during composting of different compositions of PLA and starch blends. An isothermal method was used with packed chrome pack column (poraBOND 0.32mm × 0.45mm) and the carrier gas hydrogen (1ml/minute). The injection was carried out using gas-tight 100μl syringe at the temperature of 200°C. 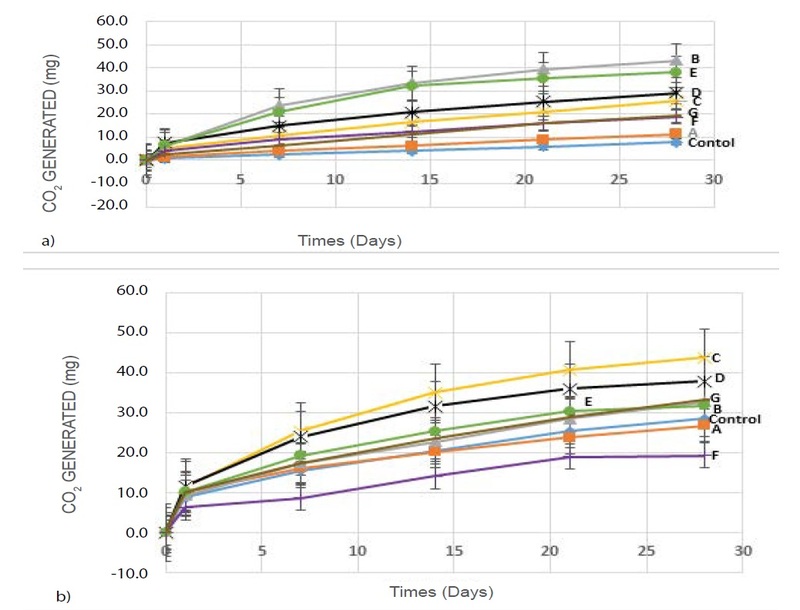 The average of three different measurements was taken once a week from polymers buried in compost and soil in closed vials at 45°C for 28 days to determine the peak areas of co2 in the GC method. The gas phase was sampled from the vials with the buried polymers and injected in triplicates with a syringe for manual injection into the GC analyser to obtain the peak areas of co2 and worked out with the calibration curve in the table and figure S1 from the supplementary information section. A range of techniques was used to characterise the polymer composites before and after degradation experiments in order to study the effect of the polymer composition, temperature, media matrix and enzymes on the degradability of the polymer blends. Gel Permeation Chromatography (GPC) instrument from Agilent technologies model 1100 series was used to measure the molecular weights of PLA before and after degradation. The GPC machine was equipped with two columns (300 mm × 7.5 mm) PLgel 5μm mixed D, and performed at 35°C with chloroform (1.0 ml/min) as the mobile phase. The number average molecular weight (Mn) and polydispersity index (PDI) of the polymer samples were calculated using polystyrene as the standard. An SDT Q600 by TA Instruments (TGA) was used to measure the change in weight under heating to study the thermal stability of the polymer blends under air and nitrogen. TGA analysis was conducted from 20-800°C at a heating rate of (20°C/minute). About 15–30 mg of the polymer sample was used in each analysis. A graphical representation of the results was produced and analysed using the Universal Analysis software suite. A PerkinElmer precisely spectrum 100 FTIR spectrometer was used to identify functional groups present in PLA, starch and PLA/starch blend samples. In the preparation of solid samples, samples were ground with potassium bromide (KBr) at the ratio of 1:100. All spectra were recorded using a scan number of 4 and 64 in the range of 4000-400 cm-1. A Phenom desk-top SEM (Phenom, FEI, USA), was used to investigate the fracture surface structure and shape of polymers before and after degradation with a high-energy beam of electrons. Polymer samples were previously dried overnight with a gold coating at an accelerating voltage of 5kV, the surface roughness was determined using the Phenom pro-suite surface analysis software at a magnification range of 500 - 20,000x at a resolution of 30nm. The degradation of PLA/starch blends was studied in two matrices (soil and compost) under two temperatures (45°C and 55°C) according to the procedures described in the experimental section in order to investigate the effect of the matrix and temperature. The effect of an enzyme was also studied by adding a different amount of lipase into the matrix. 45°C and 55°C were chosen as the experimental temperatures by considering both the environmental conditions and composting conditions commonly used in industry as well as the optimum conditions for the activity of the enzyme. The timing of 14 and 28 days was studied for the degradation of the blends in this work, but a longer time period can be further studied. However, in an industrial composting site, it is desirable to have a shorten degradable time. In order to investigate the degradation of the polymers, firstly the changes of polymer composites before and after degradation were recorded using a range of techniques such as GPC, FTIR, SEM and TGA to investigate their degradable behaviours under different conditions (section 5.1). The release of co2 into the gas phase during degradation was also determined (section 5.2). Moreover, the change in the matrices, mainly the pH, was analyzed in order to demonstrate the effect of degradation on the compost and soil (section 5.3). Molecular weights and molecular weight distribution: The neat PLA was analysed using GPC before and after degradation experiments and the results clearly demonstrated a decrease in the molecular weight of PLA owing to degradation (Table 1). The molecular weight of the neat PLA reduced from 162 kg/mol to 128 kg/mol after being buried in theThe hcompost at 45°C in an incubator for 14 days, while from 162 kg/mol to 102 kg/mol for the neat PLA buried in soil. The degradation of PLA in both compost and soil is attributed to the presence of active microorganisms, high temperature and moisture [42,43]. The degradation also caused an increase in PDI of the neat PLA from 1.7 to 2.1 for samples being buried in compost and from 1.7 to 2.4 for those being buried in soil. The degradation of the neat PLA occurs through random hydrolytic scission of ester bonds in the amorphous chains of the polymer during the degradation process. The hydrolytic attack happens because of the penetration of moisture from the environment into the polymers . Table 1: Change in Mw and PDI of PLA after being buried in compost and soil for 14 days. Thermal stability: The thermal stabilities of the polymers and their composites were ascertained before and after degradation, (with and without the addition of lipase in compost and soil) using TGA and the results were summarized in table 2 and 3. The experiments showed that the polymers degraded from temperatures, 99-330°C due to decomposition. It is observed that PLA and composites with more amount of PLA exhibited the highest thermal degradation temperature more than that of starch and composites with more of starch . The degradation process of PLA occurs within a relatively short temperature range. Table 2: The temperature at 5% and 95% weight loss of the polymer samples after being buried in compost. a. The temperature at the weight loss of 5% and 95% for the polymers buried in compost at 45oC for 14 days without the use of lipase. b. The temperature at the weight loss of 5% and 95% for the polymers buried in compost at 45oC for 14 days with the use of 10 mg lipase. c. The temperature at the weight loss of 5% and 95% for the polymers buried in compost at 55oC for 28 days with the use of 20 mg lipase. Table 3: The temperature at 5% and 95% weight loss of the polymer samples after being buried in soil. a. The temperature at the weight loss of 5% and 95% for the polymers buried in soil at 45oC for 14 days without the use of lipase. b. The temperature at the weight loss of 5% and 95% for the polymers buried in soil at 45oC for 14 days with the use of 10 mg lipase. c. The temperature at the weight loss of 5% and 95% for the polymers buried in soil at 55oC for 28 days with the use of 20 mg lipase. The TGA curves of the PLA and PLA/starch composites revealed the effect of lipase on the degradation of the polymers and their composites. Table 2 shows that polymer blends containing more starch were less thermally stable than composites containing more PLA, after being treated with lipase (10 mg or 20 mg of lipase). The thermal stability of the polymer blends reduced with the addition of 10 mg of lipase at 45°C from 94-340°C at 5% weight loss and was further reduced with an increase the addition of 20 mg of lipase at 55°C from 90-293°C at also 5% weight loss approximately. This is because of the effect of lipase which promoted degradation due to increased microbial activities which made the starch to degrade faster in the process . The effect on degradation was higher to the polymers buried in compost in the presence of 20 mg of lipase at 55°C. However, the thermal degradation of the PLA, starch and PLA/starch blends buried in soil without the use of lipase at 45°C were from 99-335°C at 5% weight loss. From table 3, the degradation after the addition of 10 mg and 20 mg of lipase in soil at 45 and 55oC further improved, reducing the thermal degradation temperature from 81-312°C also at 5% weight loss as a result of the impact of lipase. In general, we can say that PLA has the highest thermal degradation temperature thus it has better mechanical properties than starch, blending PLA with starch lowers the degradation temperature of the composites formed . Furthermore, lipase had an impact on the polymers and blends respectively, and the slow rate of degradation seen in polymer samples buried in soil . FTIR results: The results from the IR spectra of PLA, starch and their composites after being buried in compost and soil with and without the use of lipase were shown in table 4. It revealed that the FT-IR spectra all of PLA and its composites displayed peaks of absorption in the same regions.The major bands of the polymers and their composites were seen for C=O stretch vibrations region at 1751-1760 cm-1,  which was attributed to the electronegativity of the neighbouring atom around carbonyl group which tend to draw electrons between the carbon and oxygen atoms through electron withdrawing effect. All the polymers used for this study except starch showed strong absorptions in this region. Table 4: The shift of FTIR absorption band in the region for carbonyl group in the polymer blends before and after being buried in compost and soil. The spectra of neat PLA, starch and their composites, after being buried in the compost without the use of lipase, had a shift in the bands for C=O group of the polymers to a higher wave number from 1756-1759 cm-1.The table reveals that the degradation and the addition of 10 mg of lipase to these polymer composites caused the slight shift in the bands of the carbonyl groups to higher wave-numbers from 1759-1761 cm-1 when compared to the shift for the bands of the carbonyl groups of the blends before degradation and after the degradation without the use of lipase. When 20 mg of lipase was added to the polymers and their composites at 55°C, the polymers had the highest increase in vibration frequency from 1762-1762 cm-1 depicting a reduction in their molecular weights. The result of polymers after being buried in compost and soil with and without the use of lipase revealed that starch degraded more in these polymer composites after being buried in compost with 10 mg of lipase as compared to the spectra before degradation. Therefore FTIR reveals that the degradation mechanisms of PLA and its composites are mainly hydrolysis of the ester linkages, followed by the assimilation by microorganisms  Reduction in the molecular weight of the polymers caused an increase in the vibration frequency.There was no obvious difference in the results of the FTIR spectra of polymers and their blends before and after degradation owing to the fact that IR does not provide complete information on the structures and molecular formulae of polymers after degradation. However, the more lipase added, and the higher temperature used increased the degradation of the polymers and their composites . The SEM images (Figure 2) demonstrated the changes in morphology, mainly the fractured surface, of PLA and PLA/ starch composites after being buried in compost and soil for 14 days. Biodegradation occurred for all polymer samples studied, but it was observed more changes on the composites of PLA/starch (10:90) and PLA/starch (50:50) than on pure PLA samples . This implies that the addition of starch to PLA enhanced their biodegradabilities. Starch eroded from the surface of the PLA blends while for pure PLA degradation took place through its integrate polymer taking longer time . The starch granules lost their regular shapes in the blend after degradation when compared to the pure PLA. Highly eroded surface fractures with cracks are seen. Holes on the surfaces suggest that the microorganisms attacking the polymers made channels on their surfaces. Polymers after being buried in compost samples degraded more than those after being buried in soil samples. SEM images of PLA, PLA/starch composite (10:90) and PLA/starch composite (50:50) samples before degradation (A, B and C), after degradation in compost (D, E and F) and (G, H and I) after degradation in soil without the use of lipase for 14 days. 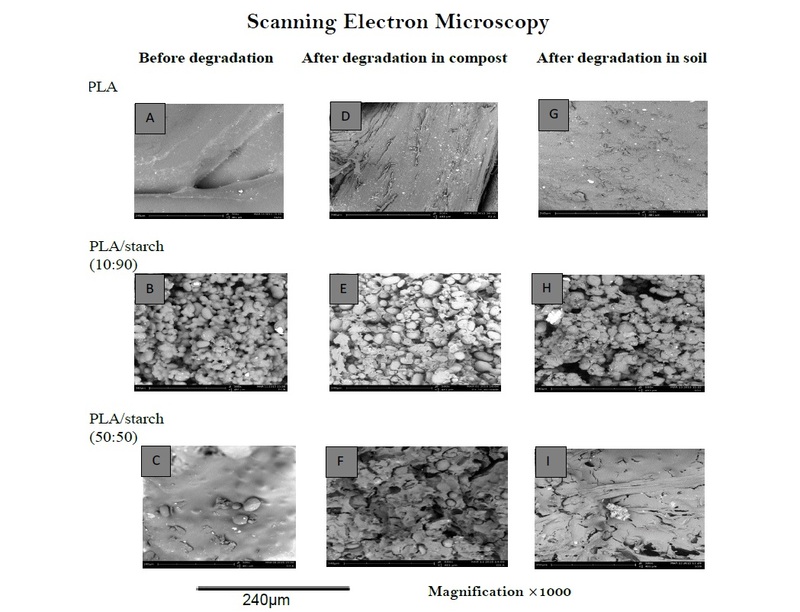 Figure 2: SEM images of PLA, PLA/starch composite (10:90) and PLA/starch composite (50:50) samples before degradation (A, B and C), after degradation in compost (D, E and F) and (G, H and I) after degradation in soil without the use of lipase for 14 days. In the compost, without the use of lipase, composites with more starch in them had the highest weight loss because the starch granules were easily hydrolysed thus altering the mechanical properties of PLA [25,45]. The weight loss of composites with starch was more than those with more PLA. Pure PLA had the least weight loss owing to the good mechanical properties it possesses. When 10 mg of lipase was added to the setup, weight loss increased and increased more when 20 mg of lipase was added with an increased condition of 55°C. Therefore the addition of lipase and the increase in temperature of the polymers being buried in compost had an impact on the matrices. Degradation had even trend and seen more on polymers in compost than in soil because compost contains microorganisms that enhanced degradation [51,52]. While in the soil, there was no even trend in the weight loss, the result showed that composite PLA/starch (10:90) had highest weight loss and pure PLA had the lowest weight loss. On addition of 10 mg of lipase, it promoted the degradation of the composites. The weight loss of polymers and their composites buried in soil with the use of 20 mg lipase at 55°C revealed that there was a decrease in the weight loss of the polymers and blends as shown in figure 3 and table 5. The soil setups exhibited that an increase in starch content and the addition of lipase increased the weight loss of the polymers except for the setup with buried polymers in the presence of 20 mg of lipase. This could be due to the lipase used and microorganisms present in the soil were not too active or they were not supported by the increase of the temperature from 45°C to 55°C. Table 5: The weight change in polymers as a result of biodegradation in compost and soil with and without the use of lipase at 45oC and 55oC. The weight changes in polymers as a result of biodegradation (A) in compost and (B) in soil with and without the use of lipase at 45OC for without lipase and with 10mg of lipase while at 55OC with 20mg lipase. Figure 3: The weight changes in polymers as a result of biodegradation (A) in compost and (B) in soil with and without the use of lipase at 45OC for without lipase and with 10mg of lipase while at 55OC with 20mg lipase. Figure 3 and table 5 revealed that there was an increase in the weight loss of polymers buried in both compost and soil after degradation. The amount of co2 released from polymers buried in compost and soil with and without the use of lipase was determined by titration method. The setups containing buried polymers were connected to an alkaline solution at 45°C and 55°C in an incubator as shown in Figure 1. The amount of co2 generated was tested at days 4,7,14 and 28 by titrating the alkaline solution against hydrochloric acid as described by Stotzky . The average of three titrations was taken to determine the amount of co2 (mg) that was produced. Figure 4 (I and II) showed that the highest amount of co2 was released from pure starch buried in both compost and soil at 45oC without the use of lipase, followed by the blends containing more starch. This result suggests that the increase in co2 generated was due to the enhanced degradability caused by the addition of starch used up by microorganisms as food . 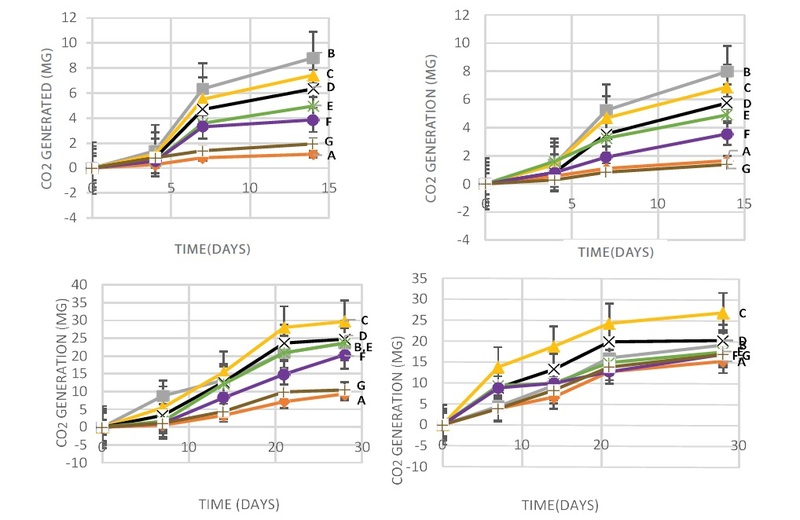 Figure 4 (III and IV) revealed the addition of 10 mg of lipase to compost and soil at 45°C at day 15, the co2 generated was doubled compared to the results when no lipase was used. The blends with more starch generated more co2, i.e. PLA/starch (10:90) >PLA/starch (25:75) > starch > PLA/starch (50:50) > PLA/starch (75:25) >PLA/ starch (90:10)> PLA. co2 released from the polymers buried for 14 days in (I) compost and (II) soil without the use of lipase at 45oC determined by titration method. While the polymers buried for 28 days in (III) compost and (IV) soil with the use of 10mg lipase at 45oC, determined by titration method. A-PLA, B-Starch, C-PLA/starch (10:90), D-PLA/starch (25:75), E-PLA/starch (50:50), F-PLA/starch (75:25), G-PLA/starch (90:10). Figure 4: co2 released from the polymers buried for 14 days in (I) compost and (II) soil without the use of lipase at 45oC determined by titration method. While the polymers buried for 28 days in (III) compost and (IV) soil with the use of 10mg lipase at 45oC, determined by titration method. A-PLA, B-Starch, C-PLA/starch (10:90), D-PLA/starch (25:75), E-PLA/starch (50:50), F-PLA/starch (75:25), G-PLA/starch (90:10). In order to increase the degradation rate of the blends, more lipase (20 mg) and a higher temperature (55°C) were adopted (Figure 5I and II). Interestingly, the results showed a decrease in the co2 generated compared to figure 4(III and IV) in which 10 mg of lipase was used under 45°C. This could be caused by a higher temperature 55°C at which lipase may not be as active as at 45°C. Moreover, more co2 was generated from polymers buried in compost than those buried in soil, and more co2 was released from the composites containing more starch. co2 released from the polymers buried for 28 days in (I) compost and (II) soil with 20mg lipase at 55oC determined by titration method. A-Starch, B-PLA/starch (10:90), C-PLA/starch (50:50), D-PLA/starch (90:10). Figure 5: co2 released from the polymers buried for 28 days in (I) compost and (II) soil with 20mg lipase at 55oC determined by titration method. A-Starch, B-PLA/starch (10:90), C-PLA/starch (50:50), D-PLA/starch (90:10). GC was also used to determine the co2 released from the polymer composites being buried in the compost at 45°C for 28 days with and without lipase. The gas samples were taken from closed vials for GC analysis once a week (Figure 6I and II). Five known concentrations of the reference standard dry ice were injected in triplicates into the GC machine to obtain the working calibration curves. The Linear Regression for the Equation was used to solve out for the amounts of co2 generated. co2 released from the polymers buried for 28 days in compost a) without the use of lipase and b) with 10mg lipase at 45oC, determined by GC method. (A-PLA, B-Starch, C-PLA/starch (10:90), D-PLA/starch (25:75), E-PLA/starch (50:50),F-PLA/starch (75:25), G-PLA/starch (90:10) and control). Figure 6: co2 released from the polymers buried for 28 days in compost a) without the use of lipase and b) with 10mg lipase at 45oC, determined by GC method. (A-PLA, B-Starch, C-PLA/starch (10:90), D-PLA/starch (25:75), E-PLA/starch (50:50),F-PLA/starch (75:25), G-PLA/starch (90:10) and control). Figure 6 (I) revealed that 43 mg co2 was released from starch being buried in compost without the use of lipase, comparing to 7.9 mg for the control sample without polymer. Figure 6 (II) revealed that the addition of 10 mg lipase, more co2 was released, for example, 43.8 mg co2 released from PLA/starch (10:90) while the least co2 was released from blend PLA/starch (75:25) within the 28 days of the study. Lipase had more impact on the blends containing more starch. The result shows that the addition of lipase promoted degradation of polymers and blends. The pH of compost and soil is important because it will have a significant impact on the plant growth. The pH of the compost and soil was measured before and after polymers were buried in them with the addition of 10 mg lipase. The pH values of compost and soil were 5.8 and 5 respectively before polymer degradation occurred. The pH was increased due to the degradation of polymer blends in compost (Figure 7A), however, there was decreased in soil (Figure 7B). Starch had the highest pH at 6.7 while control had the lowest pH value at 5.8 in compost. This could be attributed to degradation process, the fast evolution of co2 and the action of microorganisms on the nutrients in the compost samples . Figure 7B revealed the degradation of polymers and their composites had an impact on the pH of the soil samples, by reducing the pH of all the soil samples compared to the original soil pH of 5, making the environment acidic. This could be attributed to the reaction of co2 generated with the water seen in the soil samples making the environment more acidic. It is stated that PLA had the slowest reaction rate at solutions with pH 4, because of its pKa of lactic acid of 3.84, [53,54] solutions with pH > 4 will have lactic acid that is mostly in a dissociated form, thus enhancing hydrolysis . Fluctuations in pH affect not only the rate of hydrolysis but also the thriving of microorganisms . pH values of (A) compost and (B) soil samples after polymers being degraded in them for 28 days. Figure 7: pH values of (A) compost and (B) soil samples after polymers being degraded in them for 28 days. The morphological, structural and spectral techniques reveal that an increase in the temperature of both compost and soil and the addition of starch and lipase to neat PLA over time, accelerated the rate of degradation of neat PLA and its composites especially with the composites with more starch in them, [46,48] this is because starch was easily eroded by microorganisms as a source of food causing an increase in the weight loss of polymers and thereby yielding more co2 gases [25,45]. PLA and starch blends at different ratios were prepared and buried in compost and soil for 14 and 28 days to monitor degradation under 45 and 55°C. The degradation of these blends was studied by visual inspection, GPC, TGA, FTIR, SEM, weight loss (%), titration and gas chromatography methods. The polymers and their blends changed colour and lost their shapes due to degradation. The results revealed that the introduction of starch to PLA made the obtained blends more brittle, less thermally stable, and more susceptible to degradation. The polymers and their blends degraded more in compost than in soil possibly due to differences in the microbial activity in these different environments. Finally, the addition of lipase and the increase in the temperature can accelerate degradation of the polymers. Mr John Flaherty from Greener Polymer was thanked for providing PLA and starch samples.